Last week, we announced the members of the second New Profit Women’s Accelerator cohort. Stay tuned this week for a more in depth look at each of these amazing female social entrepreneurs and their organizations. Today, we shine a spotlight on Sayu Bhojwani and The New American Leaders Project. 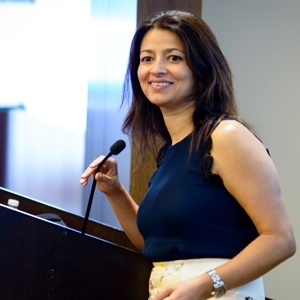 Sayu Bhojwani is the Founder and President of The New American Leaders Project. She served as New York City's first Commissioner of Immigrant Affairs under Mayor Michael R. Bloomberg, from 2002 to 2004. During her tenure as Commissioner, New York City established Immigrant Heritage Week to honor the contributions and cultures of immigrant communities in the City. Her office facilitated the passage of the earliest laws to increase immigrants' access to translation and interpretation (Local Law 73) and spearheaded the writing and Mayor's signing of Executive Order 41, an unprecedented policy to protect the confidentiality of immigration status for those seeking City services. In 1996, Sayu started South Asian Youth Action (SAYA! ), to develop the leadership potential of immigrant youth in Queens. The first and only organization of its kind, SAYA! currently works with over 500 youth each year. Sayu holds a Ph.D. in Politics and Education and an M.Ed. in Comparative Education from Teachers' College, Columbia University, and is a recipient of numerous awards for her community leadership. Sayu serves on the boards of the National Immigration Forum and The AfterSchool Corporation (TASC). She is an immigrant of Indian descent who was raised in Belize, Central America, and is a naturalized citizen of the United States. The New American Leaders Project seeks to create a more inclusive democracy by preparing first and second generation Americans to use their power and potential in elected office. NALP is the only national, nonpartisan organization focused on bringing New Americans into the political process. The organization accomplishes their goals by: training and inspiring immigrant leaders of all racial and ethnic backgrounds to run for office, building partnerships and coalitions among New American elected officials so they can advance more inclusive policies from state to state, and researching solutions to create a more diverse leadership and make the political system more accessible to all Americans. NALP works in partnership with state-based organizations to recruit leaders from immigrant communities to participate in their core 3-day training program Ready to Lead. This signature training curriculum identifies the immigrant experience as an asset in civic leadership. They train participants on messaging, targeting, and fundraising--and help them understand how to leverage their story and their community as assets to the political process.